Integrated fill-and-pour spout offers the easiest, most ergonomic system available in a fully compliant Type II safety can. Automatic closure is integrated into a single patented, smooth pouring zinc die cast spout. UNO's exclusive ergo-progressive design features a Safe-Squeeze?trigger mechanism that releases liquid with precise timing... controlling the liquid flow when you're ready. Handle and trigger are designed for a natural grasp. The weight of the can rests firmly in the strongest part of the hand, the palm, while a simple finger squeeze on the trigger opens the piston-actuated spout and vacuum release valve for accurate, glug-free pouring. Half-inch raised bottom offers secure grip lip during pouring. A release of the handle instantly closes the valve to guard against dangerous, surprise "spill-overs." For single-handed filling, simply engage the liftlatch with your finger and push down on the trigger to open the fill spout. 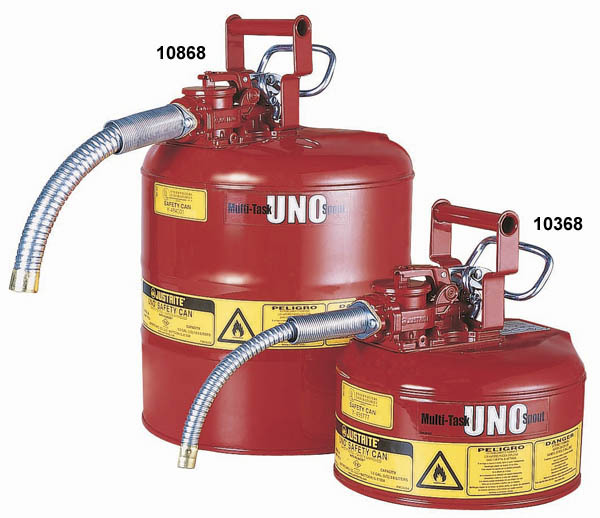 In addition to meeting your ease-of-use and performance needs, UNO's built-in safety features include an internal dual-density flame arrester to dissipate heat and prevent flashback ignition; leaktight, self-closing lid; automatic venting between 3 and 5 psig to guard against pressure build-up at elevated temperatures and potential explosion; and each and every can is 100% tested to guarantee leakproof construction. The flexible metal hose provides a grounding path to prevent static sparks when a grounding wire is used.